In Buddhism we use the words "self" and "no-self," and so it is important to understand just what this "no-self," anatta, is all about, even if it is first just an idea, because the essence of the Buddha's teaching hinges on this concept. And in this teaching Buddhism is unique. No one, no other spiritual teacher, has formulated no-self in just this way. And because it has been formulated by him in this way, there is also the possibility of speaking about it. Much has been written about no-self, but in order to know it, one has to experience it. And that is what the teaching aims at, the experience of no-self. Yet in order to experience no-self, one has first to fully know self. Actually know it. But unless we do know what this self is, this self called "me," it is impossible to know what is meant by "there is no self there." In order to give something away, we have to first fully have it in hand. The self-identification becomes insecure, and "me" finds it hard to say "look at me," "this is me." Praise and blame are included. Praise reaffirms "me." Blame threatens "me." So we like the praise and we dislike the blame. The ego is threatened. Fame and infamy — same thing. Loss and gain. If we gain, the ego gets bigger; if we lose, it gets a bit smaller. So we are constantly in a quandary, and in constant fear. The ego might lose a little bit of its grandeur. It might be made a bit smaller by someone. And it happens to all of us. Somebody is undoubtedly going to blame us for something eventually. Even the Buddha was blamed. 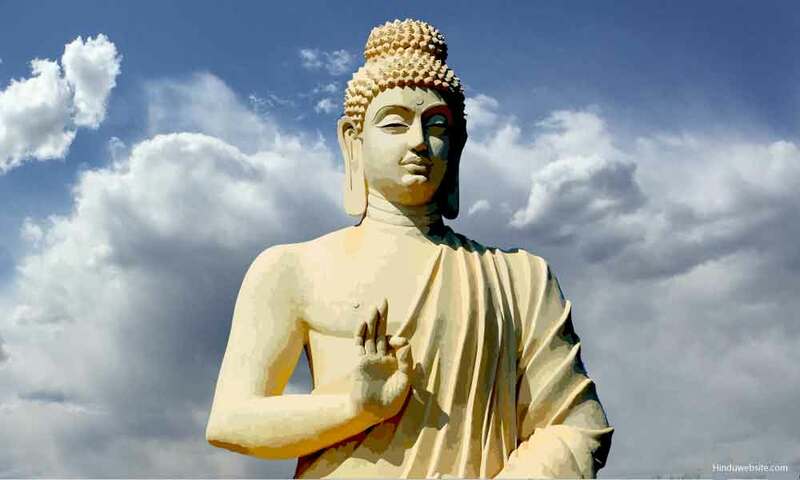 Lord Buddha compared listeners to four different kinds of clay vessels. The first clay vessel is one that has holes at the bottom. If you pour water into it, it runs right out. In other words, whatever you teach that person is useless. The second clay vessel he compared to one that had cracks in it. If you pour water into it, the water seeps out. These people cannot remember. Cannot put two and two together. Cracks in the understanding. The third listener he compared to a vessel that was completely full. Water cannot be poured in for it's full to the brim. Such a person, so full of views he can't learn anything new! But hopefully, we are the fourth kind. The empty vessels without any holes or cracks. Completely empty. I dare say we are not. But may be empty enough to take in enough. To be empty like that, of views and opinions, means a lack of clinging. Even a lack of clinging to what we think is reality. Whatever we think reality is, it surely is not, because if it were, we would never be unhappy for a single moment. We would never feel a lack of anything. We would never feel a lack of companionship, of ownership. We would never feel frustrated, bored. If we ever do, whatever we think is real, is not. What is truly reality is completely fulfilling. If we aren't completely fulfilled, we aren't seeing complete reality. So, any view that we may have is either wrong or it is partial. Because it is wrong or partial, and bounded by the ego, we must look at it with suspicion. Anything we cling to keeps us bound to it. If I cling to a table-leg, I can't possibly get out the door. There is no way I can move. I am stuck. Not until I let go will I have the opportunity to get out. Any identification, any possession that is clung to, is what stops us from reaching transcendental reality. Now we can easily see this clinging when we cling to things and people, but we cannot easily see why the five khandhas are called the five clung-to aggregates. That is their name, and they are, in fact, what we cling to most. That is an entire clinging. We don't even stop to consider when we look at our body, and when we look at our mind, or when we look at feeling, perception, mental formations, and consciousness — vedana, sañña, sankhara, and viññana. We look at this mind-and-body, nama-rupa, and we don't even doubt the fact that this is my feeling, my perception, my memory, my thoughts, and my awareness of my consciousness. And no one starts doubting until they start seeing. And for that seeing we need a fair bit of empty space apart from views and opinions. Clinging is the greatest possessiveness and attachment we have. As long as we cling we cannot see reality. We cannot see reality because clinging is in the way. Clinging colors whatever we believe to be true. Now it is not possible to say "all right, I'll stop clinging." We can't do that. The process of taking the "me" apart, of not believing any more that this is one whole, is a gradual one. But if meditation has any benefit and success, it must show that first of all there is mind and there is body. There isn't one single thing acting in accord all the time. There is mind which is thinking and making the body act. Now that is the first step in knowing oneself a little clearer. And then we can note "this is a feeling" and "I am giving this feeling a name" which means memory and perception. "This is the thought that I am having about this feeling. The feeling has come about because the mind-consciousness has connected with the feeling that has arisen." Take the four parts of the khandhas that belong to the mind apart. When we do that while it is happening — not now when we are thinking about at-but while it is happening, then we get an inkling that this isn't really me, that these are phenomena that are arising, which stay a moment, and then cease. How long does mind-consciousness stay on one object? And how long do thoughts last? And have we really invited them? The clinging, the clung-to, are what make the ego arise. Because of clinging the notion of "me" arises and then there is me, and me having all the problems. Without me would there be problems? If there weren't anyone sitting inside me — as we think there is — who is called I or me or John, Claire, then who is having the problem? The khandhas do not have any problems. The khandhas are just processes. They are phenomena, and that is all. They are just going on and on and on. But because I am grasping at them, and trying to hold on to them, and saying: "it's me, it's me feeling, it's me wanting,." then problems arise. If we really want to get rid of suffering, completely and totally, then clinging has to go. The spiritual path is never one of achievement; it is always one of letting go. The more we let go, the more there is empty and open space for us to see reality. Because what we let go of is no longer there, there is the possibility of just moving without clinging to the results of the movement. As long as we cling to the results of what we do, as long as we cling to the results of what we think, we are bound, we are hemmed in. Now there is a third thing that we do: we are interested in becoming something or somebody. Interested in becoming an excellent meditator. Interested in becoming a graduate. Interested in becoming something which we are not. And becoming something stops us from being. When we are stopped from being, we cannot pay attention to what there really is. All this becoming business is, of course, in the future. Since whatever there is in the future is conjecture, it is a dream world we live in. The only reality we can be sure of is this particular moment right now; and this particular moment as you must be able to be aware of — has already passed and this one has passed and the next one has also passed. See how they are all passing! That is the impermanence of it all. Each moment passes, but we cling, trying to hold on to them. Trying to make them a reality. Trying to make them a security. Trying to make them be something which they are not. See how they are all passing. We cannot even say it as quickly as they are doing it. There is nothing that is secure. Nothing to hold on to, nothing that is stable. The whole universe is constantly falling apart and coming back together. And that includes the mind and the body which we call "I." You may believe it or not, it makes no difference. In order to know it, you must experience it; when you experience it, it's perfectly clear. What one experiences is totally clear. No one can say it is not. They may try, but their objections make no sense because you have experienced it. It's the same thing as biting into the mango to know its taste. To experience it, one needs meditation. An ordinary mind can only know ordinary concepts and ideas. If one wants to understand and experience extraordinary experiences and ideas, one has to have an extraordinary mind. An extraordinary mind comes about through concentration. Most meditators have experienced some stage that is different then the one they are use to. So it is not ordinary any more. But we have to fortify that far more than just the beginning stage. To the point where the mind is truly extraordinary. Extraordinary in the sense that it can direct itself to where it wants to go. Extraordinary in the sense that it no longer gets perturbed by everyday events. And when the mind can concentrate, then it experiences states which it has never known before. To realize that your universe constantly falls apart and comes back together again is a meditative experience. It takes practice, perseverance and patience. And when the mind is unperturbed and still, equanimity, evenmindedness, peacefulness arise. At that time the mind understands the idea of impermanence to such an extent that it sees itself as totally impermanent. And when one sees one's own mind as being totally impermanent, there is a shift in one's viewpoint. That shift I like to compare with a kaleidoscope that children play with. A slight touch and you get a different picture. The whole thing looks quite different with just a slight shift. Non-self is experienced through the aspect of impermanence, through the aspect of unsatisfactoriness, and through the aspect of emptiness. Empty of what? The word "emptiness" is so often misunderstood because when one only thinks of it as a concept, one says "what do you mean by empty?" Everything is there: there are the people, and there are their insides, guts and their bones and blood and everything is full of stuff — and the mind is not empty either. It's got ideas, thoughts and feelings. And even when it doesn't have those, what do you mean by emptiness? The only thing that is empty is the emptiness of an entity. There is no specific entity in anything. That is emptiness. That is the nothingness. That nothingness is also experienced in meditation. It is empty, it is devoid of a specific person, devoid of a specific thing, devoid of anything which makes it permanent, devoid of anything which even makes it important. The whole thing is in flux. So the emptiness is that. And the emptiness is to be seen everywhere; to be seen in oneself. And that is what is called anatta, non-self. Empty of an entity. There is nobody there. It is all imagination. At first that feels very insecure. That person that I've been regarding with so much concern, that person trying to do this or that, that person who will be my security, will be my insurance for a happy life — once I find that person — that person does not really exist. What a frightening and insecure idea that is! What a feeling of fear arises! But as a matter of fact, it's just the reverse. If one accepts and bears that fright and goes through it, one comes to complete and utter relief and release. I'll give you a simile: Imagine you own a very valuable jewel which is so valuable that you place your trust in it so that should you fall upon hard times, it will look after you. It's so valuable that you can have it as your security. You don't trust anybody. So you have a safe inside your house and that is where you put your jewel. Now you have been working hard for a number of years and you think you deserve a holiday. So now, what to do with the jewel? Obviously you cannot take it with you on your seaside holiday. So you buy new locks for the doors to your house and you bar your windows and you alert your neighbors. You tell them about the proposed holiday and ask them to look after you house — and the safe in it. And they say they will, of course. You should be quite at ease and so you go off on your holiday. You go to the beach, and it's wonderful. Marvelous. The palm trees are swaying in the wind, and the spot you've chosen on the beach is nice and clean. The waves are warm and it's all lovely. The first day you really enjoy yourself. But on the second day you begin to wonder; the neighbors are very nice people, but they do go and visit their children. They are not always at home, and lately there has been a rash of burglaries in the neighborhood. And on the third day you've convinced yourself that something dreadful is going to happen, and you go back home. You walk in and open the safe. Everything is all right. You go over to the neighbors and they ask, "Why did you come back? We were looking after your place. You didn't have to come back. Everything is fine." The next year, the same thing. Again you tell the neighbors, "Now this time I am really going to stay away for a month. I need this holiday as I've been working hard." So they say, "Absolutely no need to worry, just take off. Go to the beach." So once more you bar the windows, lock the doors, get everything shipshape, and take off for the beach. Again, it's wonderful, beautiful. This time you last for five days. On the fifth day you are convinced that something dreadful must have happened. And you go home. You go home, and by golly, it has. The jewel is gone. You are in a state of complete collapse. Total desperation. Depressed. So you go to the neighbors, but they have no idea what has happened. they've been around all the time. Then you sit and consider the matter and you realize that since the jewel is gone, you might as well go back to the beach and enjoy yourself! That jewel is self. Once it is gone, all the burden of looking after it, all the fears about it, all the barring of doors and windows and heart and mind is no longer necessary. You can just go and enjoy yourself while you're still in this body. After proper investigation, the frightening aspect of losing this thing that seemed so precious turns out to be the only relief and release from worry that there is. There are three doors to liberation: the signless, the desireless, and emptiness. If we understand impermanence, anicca, fully, it is called the signless liberation. If we understand suffering, dukkha, fully, it is the desireless liberation. If we understand no-self, anatta, fully, then it is the emptiness liberation. Which means we can go through any of these three doors. And to be liberated means never to have to experience an unhappy moment again. It also means something else: it means we are no longer creating kamma. A person who has been completely liberated still acts, still thinks, still speaks and still looks to all intents and purposes like anybody else, but that person has lost the idea that I am thinking, I am speaking, I am acting. Kamma is no longer being made because there is just the thought, just the speech, just the action. There is the experience but no experiencer. And because no kamma is being made any longer, there is no rebirth. That is full enlightenment. In this tradition, three stages of enlightenment have been classified before one comes to the fourth stage, full enlightenment. The first stage, the one we can concern ourselves with — at least theoretically — is called sotapanna, stream-enterer. It means a person who has seen Nibbana once and has thereby entered the stream. That person cannot be deterred from the Path any more. If the insight is strong, there may be only one more life-time. If the insight is weak, it can be seven more life-times. Having seen Nibbana for oneself once, one loses some of the difficulties one had before. The most drastic hindrance that one loses is the idea that this person we call "I" is a separate entity. The wrong view of self is lost. But that doesn't mean that a sotapanna is constantly aware of no-self. The wrong view is lost. But the right view has to be reinforced again and again and experienced again and again through that reinforcement. Such a person no longer has any great interest, and certainly no belief, in rites and rituals. They may still be performed because they are traditional or that are customary, but such a person no longer believes they can bring about any kind of liberation (if they ever believed that before). And then a very interesting thing is lost: skeptical doubt. Skeptical doubt is lost because one has seen for oneself that what the Buddha taught was actually so. Until that time skeptical doubt will have to arise again and again because one can easily think: "Well, maybe. Maybe it's so, but how can I be sure?" One can only be sure through one's own experience. Then, of course, there is no skeptical doubt left because one has seen exactly that which has been described, and having seen it, one's own heart and mind gives an understanding which makes it possible to see everything else. Dhamma must have as its base the understanding that there is no special entity. There is continuity, but there is no special entity. And that continuity is what makes it so difficult for us to see that there really isn't anybody inside the body making things happen. Things are happening anyway. So the first instance of having seen a glimpse of freedom, called stream-entry, makes changes within us. It certainly does not uproot greed and hate — in fact, they are not even mentioned. But through the greater understanding such a person has, the greed and the hate lessen. They are not as strong anymore, and they do not manifest in gross ways, but do remain in subtle ways. The next stages are the once-returner, then the nonreturner, then the arahant. Once-returner, one more life in the five-sense world. Nonreturner, no human life necessary, and arahant, fully enlightened. Sensual desire and hate only go with nonreturners, and complete conceit of self, only with arahant. So we can be quite accepting of the fact that since we are not arahants, we still have greed and hate. It isn't a matter of blaming oneself for having them: it's a matter of understanding where these come from. They come from the delusion of me. I want to protect this jewel which is me. That is how they arise. But with the continued practice of meditation, the mind can become clearer and clearer. It finally understands. And when it does understand, it can see transcendental reality. Even if seen for one thought-moment, the experience is of great impact and makes a marked change in our lives. About the Author: Sister Khema was born in Germany, educated in Scotland and China, and later became a United States citizen. She now lives at Wat Buddha Dhamma Forest Monastery near Sydney Australia, which was established in 1978 on land purchased and donated by her. In 1979 she ordained as a Nun in Sri Lanka, and in 1982 she established the International Buddhist Women's Centre near Colombo. She spends most of her time teaching meditation course in different parts of the world. Rains Retreat is spent in Sri Lanka. Source: Bodhi Leaves No. 95 (Kandy: Buddhist Publication Society, 1984). Transcribed from the print edition in 1994 by Pat Lapensee under the auspices of the DharmaNet Dharma Book Transcription Project, with the kind permission of the Buddhist Publication Society. Copyright © 1984 Buddhist Publication Society. Access to Insight edition © 1994 For free distribution. This work may be republished, reformatted, reprinted, and redistributed in any medium. It is the author's wish, however, that any such republication and redistribution be made available to the public on a free and unrestricted basis and that translations and other derivative works be clearly marked as such.